The income and expenditure account is an account prepared by non-trading concerns to ascertain surplus or deficit of income over expenditures for a particular period. It is prepared as a part of final accounts of non-trading concerns and is equivalent to profit and loss account prepared by for-profit business enterprises. The accrual concept of accounting is strictly followed while preparing income and expenditure account of non-trading entities. If revenues of a non-trading concern exceed its expenditures during the year, the income and expenditure account shows a surplus balance; and if, on the other hand, the expenditures exceed income, the account shows a deficit balance. The surplus balance is also expressed as “excess of income over expenditure” and deficit balance as “excess of expenditure over income”. Income and expenditure account prepared by non-trading concerns is very much like the profit and loss account prepared by trading concerns. It is always prepared at the end of the period which usually (but not always) consists of one year. It is prepared by strictly following the principles of double entry system of accounting or bookkeeping. The incomes and expenditures of only revenue nature are included in this account. Any income and expenditure of capital nature is not included. It determines the surplus or deficit of income over expenditures of the non-trading concerns for the year. The surplus or deficit from the income and expenditure account is transferred to the capital fund account. It does not start with an opening balance; it reflects incomes received and expenditures incurred by non-trading concerns during the year. The accrual concept of accounting is strictly followed while its preparation. It is prepared by accountants appointed by the entity’s management and is audited by an independent auditor. Obtain the receipt and payment account of non-trading concern for which you want to prepare an income and expenditure account. Ignore the beginning and ending balances of receipt and payment account. Remove all the payments relating to previous years’ expenditures, future years’ expenditures and capital payments for the current year. Remove all the receipts relating to previous years’ income, future years’ income and capital revenue for the current year. Include current year’s incomes and revenue expenditures including depreciation on all fixed assets of the entity. Find the balance of the account which may be a surplus or a deficit balance. Subscription for 2017 received in 2016 – $1,000. Unpaid subscription for 2017 – $600. Fixed assets of the club on January 1, 2017 includes: Club ground – $45,000; Supports equipment – $30,000; Furniture – $5,000. Depreciation to be charged @10% p.a. on furniture and @ 20% p.a. on supports equipment. 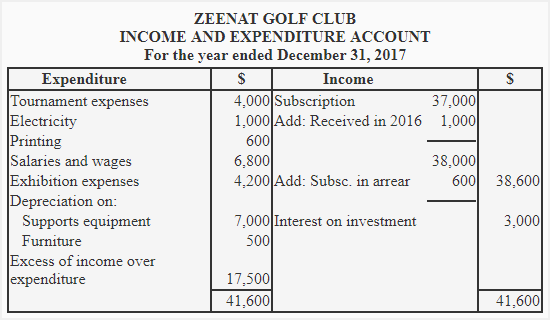 Required: Using above information, prepare an income and expenditure account of Zeenat Golf Club for the year ended December 31, 2017. Supports equipment: 20% on $30,000 for one year + 20% on $20,000 for 3 months. Furniture: 10% on $5,000 for one year. Entrance fees is a capital receipt and has therefore not been included in the income and expenditure account. The subscription only related to the year 2017 has been included. 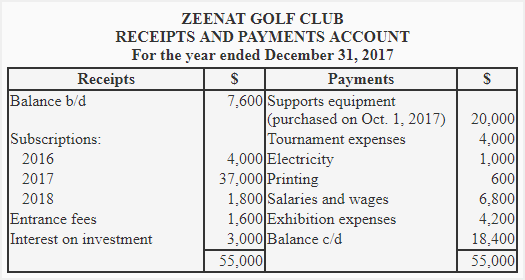 The income and expenditure account of Zeenat Golf Club shows a surplus balance of $17,500 which has been written as excess of income over expenditure. Is municipal tax a revenue item? Generalycmunicipal taxes is for a year so , it will be revenue expenditure for assesee, btw my email id is not correct , but name is correct. How did you get the the surplus balance of $17 500? If a club purchased furniture for its office use, is this expenses can be debited in the expenditure side of income and expenditure account as it has to be shown in the asset side of balance sheet? Purchase of furniture is a capital expenditure. You cannot debit it to the income and expenditure account. However, income and expenditure account must be debited with annual depreciation on furniture. What those are capital items???? And what those are revenue items??? 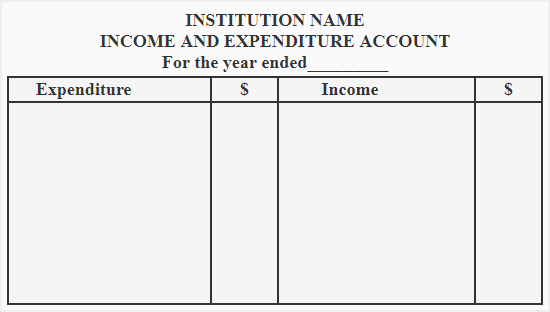 Income and expenditure account, is it used in non organisational instutitional only. Thanks for good example given dear.